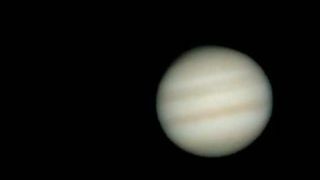 How to best observe the major planets of our Solar System. Some have worlds of their own. Tip: Astronomers measure distances in the sky in terms of degrees. For reference, your clenched fist held at arm's length covers about 10 degrees of the night sky. The brightness of a planet or other object in the sky is measured as its "magnitude." The lower an object's magnitude, the brighter it appears, so objects with negative signs in front of their magnitude numbers below are exceptionally bright. In 2011, Northern Hemisphere observers will two periods when Mercury can easily be located. During the second half of March, Mercury can be seen low in the west-northwest soon after sunset. During early September, Mercury can be seen low in the east-northeast Just before sunrise. Southern Hemisphere observers will find Mercury well placed in the morning sky during early May, in the evening sky in late July, and in the evening sky in mid-November. Let the astrologers make of that what they will. It moves into Aries on June 6. It moves back into Pisces on Dec. 3. It is best viewed in the morning sky from July until the Oct. 29 opposition, when it moves into the evening sky for the rest of the year. The angular diameter at opposition will be 49.6 arcseconds. Binoculars will show the four largest satellites. A small telescope will show one or two cloud bands across the visible surface of the planet. From September to November it will be behind the sun, reappearing in December in the morning sky. The rings will gradually be opening over the year, making them easy to see in any telescope magnifying more than about 30x. Saturn’s largest moon Titan is readily visible in a small telescope, and several more moons may be seen in larger telescopes. At opposition, the planet’s angular diameter will be 19.3 arc seconds. This 2011 Planets Skywatching Guide is provided by Starry Night Education, the leader in space science curriculum solutions.